You could make the argument that neither of these cards are as good when you’re not comboing as Deceiver Exarch was, and you would probably be right, though the ability to win on turn four is not to be written off. 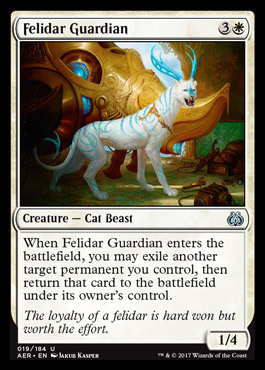 It’s also noteworthy than with six lands, you can cast Felidar Guardian, blink a land, and then cast Saheeli Rai and go off that turn. This combo is generating a ton of hype, and as such Saheeli jumped from $5 to $25. While I do believe that this combo has potential, I believe that Saheeli is a sell as of now. The reason being that it was also announced that there would be another banlist update five weeks after the Pro Tour. As such, if this combo has a dominant Pro Tour performance, it will likely be banned, and if it doesn’t perform, then the card will naturally lose value. Saheeli could potentially see more growth in the very short term, though I don’t believe that the risk is worth it.